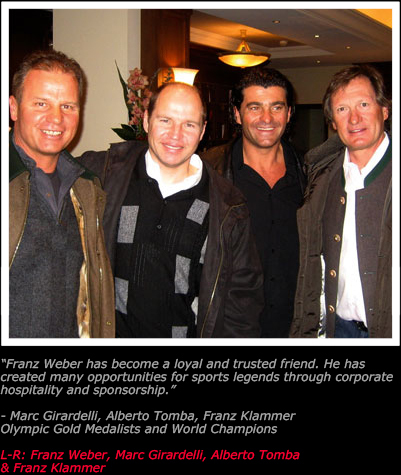 Franz Weber, Inc., a sports management and consulting company founded in 1984 primarily focuses on client hospitality, corporate outings and the representation of a select group of skiing legends, World Champions and Olympic athletes such as Franz Klammer who has been with the company since its start. The company boasts a diverse roster of personable Olympic and World Champion athletes from sports such as skiing, golf, tennis, cycling; these athletes are popular for corporate hospitality. 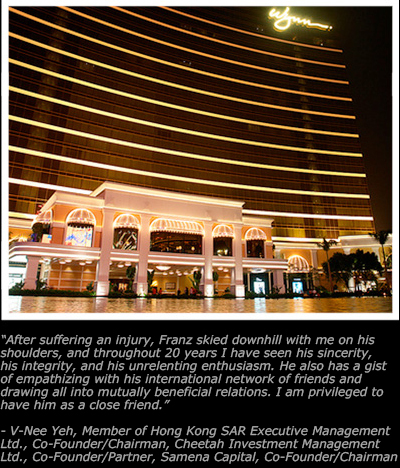 Franz Weber, Inc. has worked in the creation of sponsorships with F1 Gerhard Berger’s Scuderia Toro Rosso’s Formula One team, Lance Armstrong and Johan Bruyneel’s Tour de France team and mountain expeditions for Stephan Keck that included the Seven Summits and the world’s highest peaks. Franz Weber was selected by Governor Arnold Schwarzenegger to assist with the organization of the Governor’s senior staff cabinet off-site meetings. He was instrumental in fundraising for the Governor’s California Recovery Team. Franz initiated the idea that sparked Governor Schwarzenegger to commit to do a commercial to promote skiing in California. Franz Weber was also a successful fundraising organizer for the election campaign of President Barack Obama; these fundraisers resulted in oversold venues such as at the San Francisco estate of Ann and Gordon Getty on April 6, 2008. Franz Weber, Inc also produces various “Franz & Friends” epic adventures that include celebrities such as Arnold Schwarzenegger, Dustin Hoffman, Buzz Aldrin, Wolfgang Puck among others. The consulting division has international ski area and resort development clients and was instrumental in the creation and development of the Franz Klammer Lodge located in Telluride, Colorado, as well as the Club Regent at The Canyons in Park City, Utah. During the 90’s, Franz Weber consulted on sports, tourism and business development for the government of Kazakhstan. In the wake of the tragedy which occurred on September 11, 2001, Franz Weber, Inc. created and produced the “Tour de Franz” U.S. Relief Ride, which benefited Mayor Giuliani’s New York Twin Tower Fund and raised $1,035,000. Franz Weber, Inc. also created and produced An Evening With The Stars, a charity event that raised over $500,000 to benefit two local charities, Washoe County Senior Services Meals on Wheels and The Children’s Cabinet, Inc. Attendees indulged on the culinary talents of Chef Wolfgang Puck and David Bouley while enjoying the company of celebrity guests such as Buzz Aldrin, Gordie Brown, Nadia Comaneci, Craig Chaquico, Lou Diamond Phillips, Peter Kostis, Joe Pantoliano and Patty Sheehan. Franz Weber Inc. also supports/co-produces various events for Keep Memory Alive, which raises awareness and millions of dollars to aide in finding a cure for Alzheimer’s, Huntington’s, Parkinson’s, ALSs and other memory disorders. These events have been attended and supported by sports legends and celebrities such as Franz Klammer, Andre Agassi, Stefanie Graf, Robin Williams and world-renowned chefs such as Emeril Lagasse and Wolfgang Puck among others. Franz Weber’s well-developed business sense and knowledge of five languages, combined with his entrepreneurial spirit and extensive worldwide contacts have enabled him to play a vital role in corporate funding and investing. As a result of his introduction, David Bouley’s (Zagat’s #1 rated) restaurant in New York City was able to secure financing for its new business ventures. Through Mr. Weber’s introduction, Hong Kong’s Hsin Chong Holdings secured the development contract for the multi-billion dollar casino resort development in Macau. Franz Weber and his wife Janett endeavor to support companies that offer unique products and services. They are equity partners in Guru Books Publishing, Digital Alchemy Hospitality Software, HaberVision eyewear and First Independent Bank of Nevada. 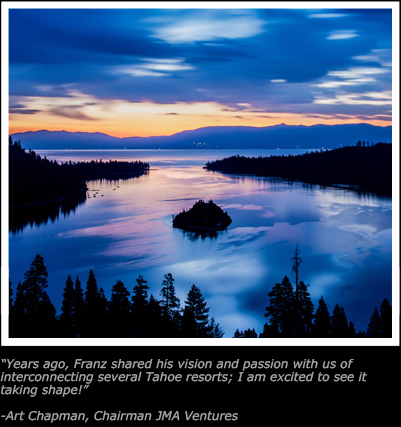 Projects currently in progress include the acquisition of various Lake Tahoe resorts and Franz’s vision of interconnecting them into one world-class destination resort. Franz Weber is also developing several high-end real estate ventures including ski-in, ski-out properties in Squaw Valley and Homewood at Lake Tahoe, California.